Solar Power Australia have over 18 years experience providing cost-effective power solutions to help businesses achieve their financial objectives, whilst making the investment to renewable energy a profitable, easy and enjoyable experience. We offer packaged pre-engineered systems (with full manufacturers warranties) or alternatively we can design a system particular to your requirements. 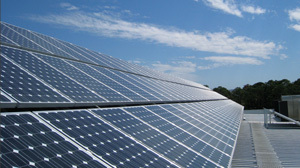 Installing renewable energy generating capacity to offset your electricity consumption, is a smart business decision in terms of insulating your business from escalating electricity costs and demonstrates your business’s commitment to contributing to Australia’s Renewable Energy Target for the year 2020. When Small-scale Technology Certificates (STCs) and Large-scale Generation Certificates (LRECs), feed-in tariffs, reduced electricity consumption and a reduced carbon footprint for your business are considered together, the business case for installing a renewable energy system is compelling. 18.4kW grid connect solar power system on Australia’s first 6-Star Energy Rated building at Bond University in Robina QLD. This system comprises of 105 x Sharp 175W monocrystalline solar modules, our Solar Rail mounting system, 3 x Fronius IG60 grid connect inverters (1 per phase) and a Fronius datalogger for system monitoring. Solar Power Australia also installed a 1kW vertical axis wind turbine which feeds power to the grid via a SMA Windyboy 1100W grid connect inverter. 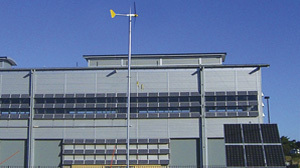 An experimental battery-connected, grid-feed solar & wind hybrid system at the CSIRO Energy Centre in Newcastle NSW. This system included a Bergey XL.1 wind turbine on a 20m tower, 6 x BP Solar BP4175 175W monocrystalline solar modules on a solar tracker, an Outback Power Systems MX60 MPPT solar controller, Battery Energy SunGel deep cycle battery bank and a Xantrex SW3024E pure sine inverter charger performing the battery connected grid feed functionality. 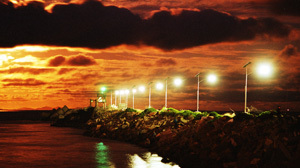 The solar lighting system on the Stockton Breakwall which allows ships and tugboats to safely navigate their way into the Newcastle Harbour at night.